A Wedding Photographer for Studio 450 events will not be short on beautiful images to capture with his camera. Studio 450 is a New York City wedding venue that is known for its incredible skyline views and large, open reception space. A Wedding Photographer for Studio 450 weddings must be conscious of not only taking pictures of the stunning views of the city, but to also catch the little moments that are shared between the bride and groom. This image at the New York City event loft space shows the bride and groom dancing together. The couple hold one another close, swaying to the music that flows around them. The two mostly look at one another, but as guests cheer and attempt to take their own pictures of the dance the bride and groom happily oblige. The newlyweds turn their smiling faces toward their loved ones, love and the magic of the this joy filled day radiating from their happy expressions. The groom can not help but keep gazing back at his new wife, adoration spilling out straight from his heart into hers. The bride glows under his attention, slightly allowing her eyes to close in the warmth of the moment. Her long eyelashes blush over her cheeks, as she looks over the ruffled shoulder of her wedding gown. 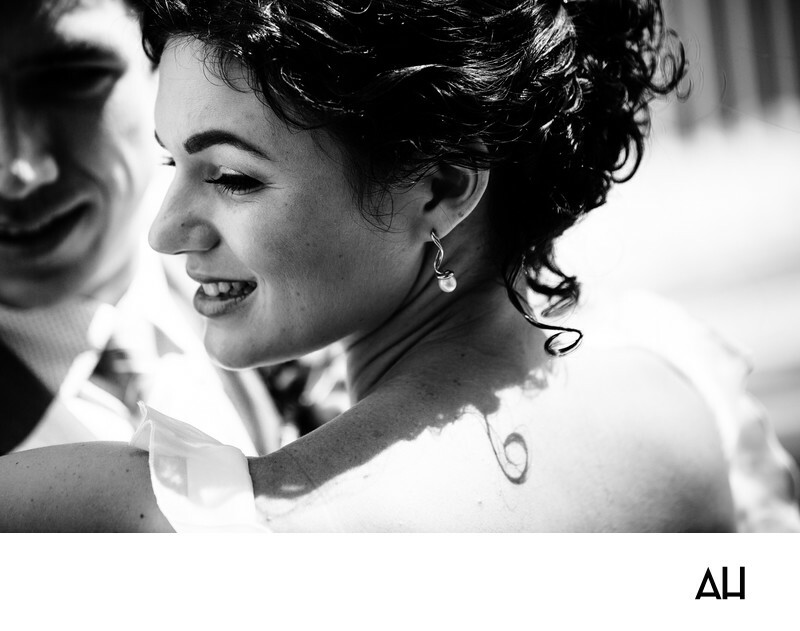 The photograph is shaded black and white, to highlight the expressions of the bride and groom in this close up. It is clear from the image, and to all who were blessed enough to stand in their presence, that these two are devoted to one another and will forever live in love.